DIY home security systems have become a popular way to avoid paying for expensive alarm equipment and pricey long-term monitoring plans from traditional, full-service home security providers. Having a security system is a key part of your home. Not only does an alarm system provide peace of mind when you’re away from your residence but you can also gain a price break on your homeowner’s insurance by having a security system in place. If you’re interested in setting up a DIY system for your home, here’s what you need to know about this important home improvement. Because some DIY home security systems don’t require you to drill holes into walls or hardwire equipment into the electrical system, you can secure your residence even if you rent. Components are designed to attach to the wall with sticky foam strips that you can remove anytime. This setup also means you can take your home security system with you when you move; you won’t have to start over and repurchase hundreds of dollars of equipment. You don’t need a landline, either; today’s systems use cellular service and WiFi. If you lose power, a combination of cellular connections and battery backups will keep your home safe for hours. And it’s great for people who aren’t keen on letting strangers into their homes. You also don’t have to coordinate with an installer’s schedule or pay an installation fee, and you can set up your system based on your desires instead of instructing someone else on how to do it and looking over their shoulder to make sure it’s done right. First, you’ll want to read reviews of the different DIY home security systems to narrow down which ones are the best fit for your needs and budget. Once you’ve chosen a system, you’ll need to evaluate your security needs to determine what equipment to purchase. The most basic system will have a keypad for arming and disarming your system and entry sensors for all your doors and windows. You can add motion detectors (make sure your pets won’t trigger them, especially if you have large dogs), glass break sensors, keychain remotes, cameras, smoke detectors and more. Watching a YouTube video is an easy way to learn how to setup your new system once you’ve purchased it. Viewing a video ahead of time is also a good way to check out a system before committing to it. You can buy components directly from the security companies online or through resellers such as BestBuy and Amazon. Shop around to get the best price and return policy. Many localities require an alarm permit. Check with your police department to see if you need one. If your area requires a permit and you don’t have one, expect to pay a fine the first time police are dispatched to your house or the neighbors report a false alarm. Also, read up on the alarm codes in your area so you are up to speed on fines. Unlike traditional systems, DIY systems don’t require you to connect to a dispatch center. In other words, if you don’t want or can’t afford remote monitoring, you don’t have to sign up for it. This means that if someone breaks in, the police will not be dispatched to your home unless you call them. You’ll have to call them yourself when you hear the alarm (if you’re home) or when you get a mobile alert on your phone (if you’re not home). Self-monitoring isn’t the safest option, but it’s safer than not having a security system at all. DIY monitoring leaves you vulnerable. It means trying to call 911 while hiding from an intruder in your house or attempting to escape. It means never being able to put your phone on silent because you might miss an alarm notification. Fortunately, DIY home security systems provide optional professional monitoring. The monthly cost may be lower than what you’d pay a traditional security provider, and you won’t be locked into a long-term contract. The pricing will be transparent, too: you won’t have to hand over your personal information to get a quote or talk to a salesperson to find out how much your system and monitoring might cost. The information should be online. The downside of not signing a long-term contract is that your monthly rate isn’t guaranteed; it could go up at any time. But it could also go down, and if so, you’ll be able to take advantage of the lower price. So how does professional monitoring work with DIY systems? Your system will be linked to a central dispatcher that will notify you when an alarm is triggered. If you don’t respond—or if someone else responds and can’t provide your safe word—the central dispatcher will send the police to your home. If you have a smoke detector connected to your system, firefighters can be sent to your house if the detector goes off. Professional monitoring gets you the fastest possible response to any incident at your home. The downside is that you must make sure your system is operating correctly and doesn’t trigger false alarms. You don’t want emergency services dispatched to your house for no reason. But having a dispatch center in between your alarm system and the emergency services helps cut down on this problem. Professional monitoring also allows you to make use of panic-button and silent-alarm features to have police directly sent to your house in an emergency. If cost is a concern, make sure to look at the long-term cost of the monitoring services. Consumer Reports found that the 5-year cost of various systems can range from $620 to $3,484 depending on the system components and the level of monitoring you need. Some DIY home security systems are meant to integrate with smart home technology such as smart thermostats, smart locks, doorbells with built-in cameras, Amazon Alexa and Z-wave lights. Have teenagers at home? Get a notification when the liquor cabinet door is opened. Some systems also work with IFTTT commands. “If this, then that” can automate tasks such as turning off your thermostat when you leave the house or turning on your lights when someone rings your doorbell. 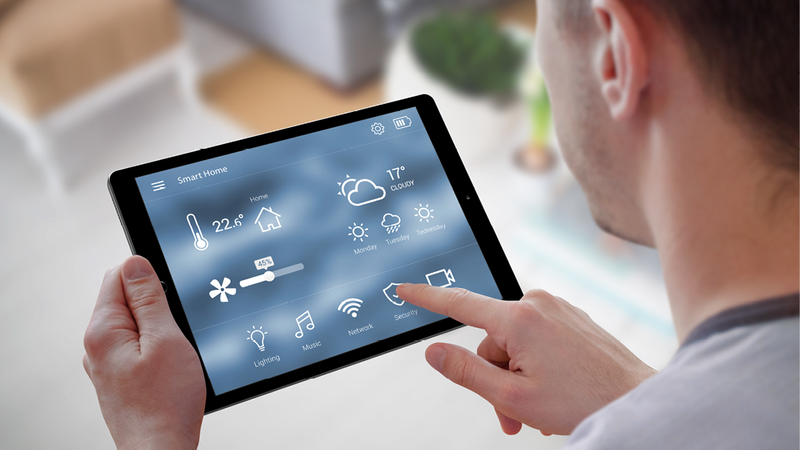 Some DIY systems integrate with only a single smart home component from a single manufacturer; others have much broader capabilities. Each DIY system offers something a bit different, and that’s a good thing, because no two homes have the exact same security needs and preferences. You might want to monitor your own system; your neighbor might want professional monitoring. You might want indoor security cameras that you can view from your phone; the same technology might creep your neighbor out. In addition to choosing among different levels of monitoring, you’ll be able to choose between pre-packed systems and putting together the individual components you need to create a custom package. You might want an extra-loud alarm, three motion sensors, a smoke detector, and 10 entry sensors. Your neighbor might want a quieter alarm and a handful of entry sensors for the most vulnerable entry points. There’s a setup for almost anyone. If you’re thinking about installing a system, click on this link -- DIY home security system reviews -- to learn about some of the more popular and effective DIY systems.